Steven ‘SvZff’ van Zadelhoff ascends to the top spot for the first time in his career. 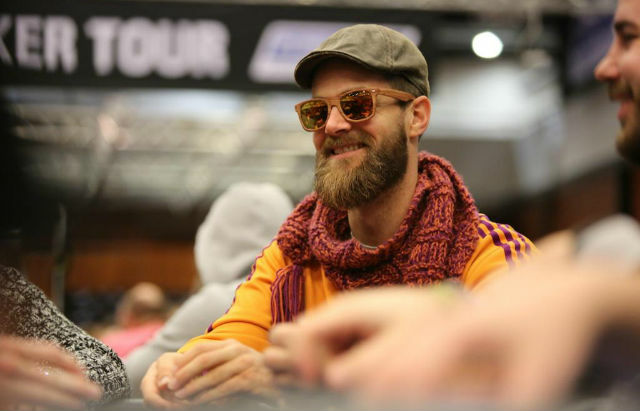 For the first time in his multi-million dollar, World Championship of Online Poker Main Event-winning career Steven ’SvZff’ van Zadelhoff sits as the #1-ranked online poker player in the world. On the heels of the Swedish legend ‘C Darwin2‘ for weeks now, van Zadelhoff pulled himself to the top of the heap with a victory in the $250,000 Title Fight on partypoker for $43,000 and 500.00 PLB points. That, along with another pair of qualifying scores, eclipsed both ‘C Darwin2’, who still sits in the #2 spot this week, as well as the difficult to reach 10,000 PLB point barrier. In addition to celebrating the #1 spot this week, van Zadelhoff found himself creeping up over $7.5 million mark in lifetime earnings on the back of a massive $84,000 earnings week. He’s going to have to stay on the grind if he wants to keep his new position though, as ‘C Darwin2’ is only 167 points away from reclaiming the top spot. While the ‘C Darwin2’s volume was still light this week, the dangerous Swede had a pair of big-time qualifying cashes bringing him over $30,000 and keeping him in striking distance headed into the final week of 2017. Again this week, there was no change to the #3 and #4 spots, as ‘lena900‘ and the top-ranked Russian ‘josef_shvejk‘ both held their respective positions, the rest of the Top 10 had players shifting in the list. ‘Sheater‘ climbed back into the Top 5 this week thanks to his runner-up finish in the partypoker High Roller for $8,926 and right on his heels, Russia’s ‘hellohellohello‘ occupies the #6 position, trailing ‘Sheater’ by only 65.79 points and also trailing ‘josef_shvejk’ by a mere 124 points. When speaking about top Russian though, it’s best not to leave out the player in the #7 spot this week, the former #1-ranked ‘veeea‘. ‘veeea’ jumped up three spots, from #10, on the back of his runner-up finish in the PokerStars Sunday High Roller for $35,180 and nearly 300.00 PLB points. Johannes ‘Greenstone25’ Korsar continues his climb to get back to his all-time high ranking, as he ascends again this week, climbing 1 spot to #8. In 2016 Korsar, touched the #6 spot and now, at the end of the year, he’s been flirting with not just getting back to that spot, but potentially surpassing it. For that to happen though, he may need a boost in volume, having essentially only played the Sunday schedule this past week. As player go up in rankings that means that some need to slide to make way for them. Fabrizio ‘SixthSenSe19’ Gonzalez made the most room, falling four spots back to #9 and it’s easy to see why: he likely took a break, as the Uruguay grinder posted a single result this week. Rounding out the holiday Top 10 is Sweden’s Andreas ‘r4ndomr4gs’ Beggren who slipped two spots to #10 despite finding victories in three different events on three different sites. While it didn’t qualify for a triple crown, Bergren finished first in a PokerStars $50K Guaranteed, the $15,000 GREAT 8 on 888poker as well as the Eliminator on partypoker – all on the same day – bringing him over $20,000. In other notable Top 25 moves, Brazil’s ‘sitpro2011‘ continues his rapid rise through the ranks, reaching his all-time high by jumping 10 spots to #21 while Kenny ‘SpaceyFCB’ Hallaert rejoins the ranks by touching the #25 spot this week.